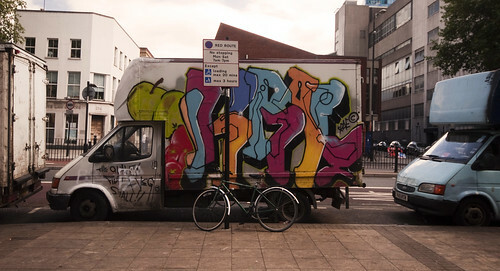 This entry was posted in Uncategorized and tagged east end, london, street design, street furniture, white vans, whitechapel. Bookmark the permalink. Where I live, a guy used to have two big vans like that parked end to end, so you couldn’t break into the rear doors. Stored god knows what in there until the DVLA got a bit more pro-active about tax discs, and they soon disappeared. I’m thinking of buying a decrepit old van simply to store my and my girlfriend’s bikes. It’s ground floor access and doesn’t clutter up the flat. 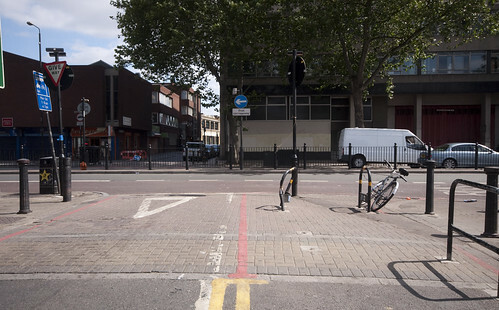 This is after my request for on-street secure cycle cages was regarded with incredulity and derision by my council. I do hope they are not driven out by new emissions regs or whatever – they are certainly performing a more useful function than whatever would replace them if the parking spaces were to be freed up.